Bone Suckin' Beef Jerky is a brand of Ford's Foods, Inc. based out of Raleigh, NC. They're more famous for their Bone Suckin' Sauce. 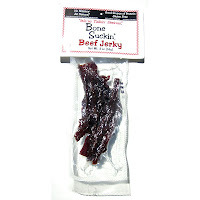 While the company has been around since 1992, it was only last month they started selling their own branded beef jerky. It's actually manufactured by Umpqua Indian Foods, a brand belonging to the Cow Creek Band of Indians based in Roseburg, OR. 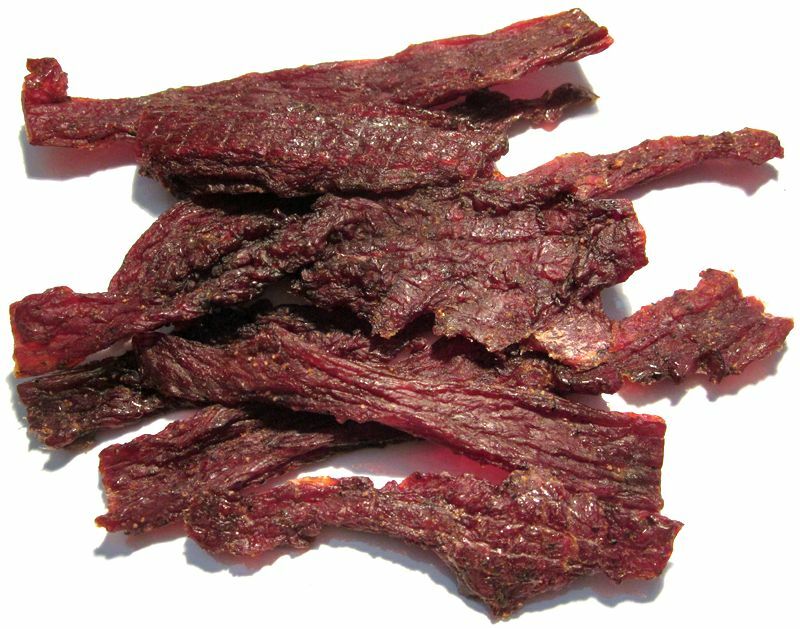 I actually reviewed several varieties of jerky from Umpqua Indian Foods a couple of years ago, however, it appears this jerky contains different ingredients than what I reviewed back then. You can read those reviews here. But it doesn't appear that this jerky contains Bone Suckin' Sauce. 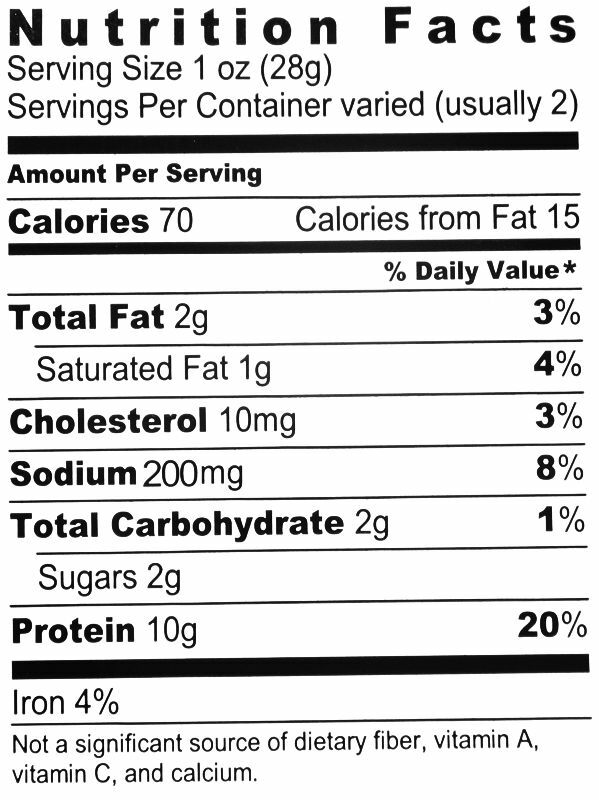 There's nothing on the label nor in the product literature saying so, and the ingredients list doesn't indicate it. In fact the ingredients doesn't contain the same ingredients as the sauce. Beef, water, brown sugar, vegetable protein from soybeans and water, apple cider vinegar, seasalt, black pepper, celery powder (celery juice, sea salt, raw sugar, spices), garlic. The first thing I taste from the surface of these pieces is a light sweetness, and a light fatty flavor. The chewing flavor starts with a light natural meat flavor, followed by a light saltiness. That celery powder is noticeable. I've never actually had Bone Suckin' Sauce, and after eating a couple of these jerky pieces, I'm confident there's none of that sauce in here, and nor is this jerky intended to have that flavor. This jerky is mild, with a low flavor intensity. In trying to identify which ingredient has the dominant flavor, I'm having to give it to the celery powder. That is, I can actually taste something that resembles celery. The light natural meat flavors are barely noticeable. It seems to mix into the celery powder to create what is overall a light jerky flavor. 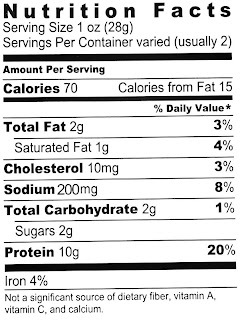 Even the saltiness is light, which is backed up the relatively light sodium content listed on the nutrition label. Overall, what you're going to taste in this is a combination of a light natural meat flavor mixed with the celery powder. There's a very light saltiness, and a smidgeon of sweet noticeable on the surface. This is a dry jerky with a dry surface feel. These pieces have little flexibility in that they will crack apart if bent just a little. Biting off chunks seems easy to do, while chewing is somewhat easy. The chewing texture starts out feeling stiff, and offers a little chewing resistance and therefore chews down to a soft mass somewhat easily. At that point, it tends to have a very meaty, steak-like chewing texture. These pieces appear to be very lean in that I don't see any bits or streaks of fat. I encountered no tendon or gristle, no stringiness, and found no unchewable wads of tissue. In terms of clean eating, it's very clean. I find no residue on my fingertips, and no fragments of meat falling off my lap. Ford's Foods, Inc. sells Bone Suckin' Beef Jerky from its website at a price of $7.99 for a 2oz package. I bought four packages. They tacked on shipping and sales tax of $14.29 and $3.58 respectively. The total came out to $49.83. That works out to a price of $6.22 per ounce. 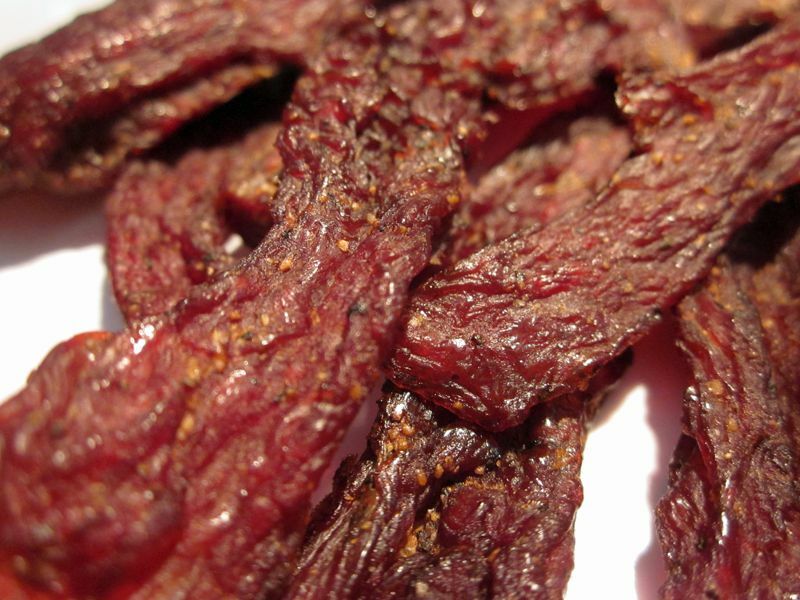 For general jerky snacking purposes, it's a poor value. I'm not getting any decent snackability from this due to a low flavor and lackluster flavor at that, though it has a good meat consistency and chewing texture. That price is extremely expensive, and could be the most expensive jerky I've ever had. Even if I didn't pay the shipping and tax, it would work out to $4.00 an ounce, and still very expensive for jerky. Jack Link's Original has a comparable flavor, while Oberto's Original is a little bit better, but far, far less costly. Bone Suckin' Beef Jerky seemed to be a disappointment on two levels. For one, it's not very flavorful. It has a light natural meat flavor, and just a light saltiness and seasoning. After eating several pieces, it builds up a blandness. But second, it fails to live up to its Bone Suckin' Sauce reputation. When you think of BBQ sauce, you think of something bold, tangy, sweet, and spicy. And this jerky offers none of those characteristics. 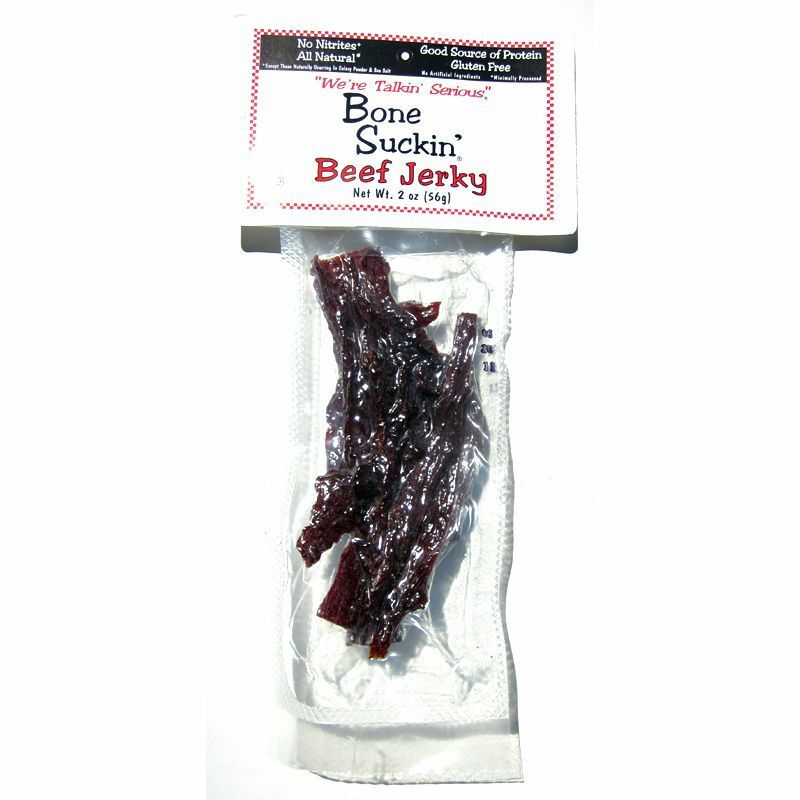 If you were to see this jerky at a store, you'd buy it because of the reputation of Bone Suckin' Sauce, and yet when you eat this jerky what you get is bland and boring. At least other BBQ brands that offered its own jerky, Famous Dave's, Stubbs, Sweet Baby Ray's, offer up the flavor of their sauces and seasonings in their jerky. I expected Bone Suckin' Sauce to have done the same. And considering how expensive this jerky is, you'd at least expect to taste their famous sauce. I think a good beer pairing for this is a double IPA, which will give you the complex flavors and aromas that you'll want after eating several pieces of this jerky. Try my favorites, Russian River's Pliny the Elder, or Grand Teton's Lost Continent.